Resources in the Concertina Library for early Wheatstone "Double" system Duet concertina. Wheatstone & Co. list of models and prices for Double duet concertinas. Dated c. 1850 by by comparing sales prices to those in the Wheatstone Concertina Ledgers. Photographic documentation of very early Double duet (1847-1848). This No. 23 has only 45 keys, smaller than the 57-key size which is shown in the tutor or the 67-key size exemplified by Danny Chapman's No. 14. 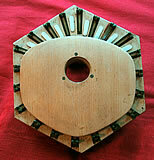 It contains an original additional baffle to reduce the volume of the bass side. 34 photographs. A very early duet (1845-1846), in the largest size known for a Wheatstone Double duet. Historical business records from C. Wheatstone & Co. are held at the Library of the Horniman Museum in London. The earliest ledgers from the Wayne Archives contain company sales records from the late 1830s to the 1860s (though with some large gaps) along with production records from the 1860s to the 1890s and some early records of wages and other payments. Later ledgers from the Dickinson Archives contain production records from 1910 to 1974, again with some gaps. All known ledgers have been digitized (some 2,300 pages in total) and made available free on this website for private research.